The survey finds that while Republicans and Democrats are deeply divided in views of Israel, so too do they differ markedly in opinions about Benjamin Netanyahu, Israel’s prime minister. Nearly three times as many Republicans (52%) as Democrats (18%) have favorable impressions of Israel’s leader. About half of Americans say a two-state solution is possible in the Middle East: 49% say a way can be found for Israel and an independent Palestinian state “to coexist peacefully,” while 39% say this is not possible. Democrats are far more likely than Republicans to say a two-state solution is possible (58% vs. 40%). When asked about the dispute between Israel and the Palestinians, 46% of Americans say they sympathize more with the Israelis, 16% say they sympathize more with the Palestinians and about four-in-ten (38%) either volunteer that their sympathies are with both (5%), neither (14%) or that they do not know (19%). The overall balance of opinion has fluctuated only modestly since 1978, when 45% said they sympathized more with Israel, 14% with the Palestinians and 42% could not decide. But the partisan divide has widened considerably, especially over the past two decades. The share of Republicans who sympathize with Israel has never been higher, dating back four decades. Nearly eight-in-ten Republicans (79%) sympathize more with Israel than the Palestinians, while just 6% sympathize more with the Palestinians; another 7% say they sympathize with both or neither, while 9% say they do not know. As was the case last year, Democrats are divided in views of the Middle East conflict: Currently, 27% of Democrats say they sympathize more with Israel, while 25% say they sympathize more with the Palestinians; another 23% say they sympathize with neither or both sides and one-quarter (25%) say they don’t know. Democrats also were divided last year, when 33% said they sympathized with Israel and 31% said the Palestinians. Since then, the share of Democrats saying they don’t know has increased from 17% to 25% and the share saying they sympathize with both or neither has ticked up slightly from 19% to 23%. As recently as two years ago, in April 2016, Democrats were more likely to sympathize more with Israel (43%) than with the Palestinians (29%), with 16% saying they sympathized with both or neither. 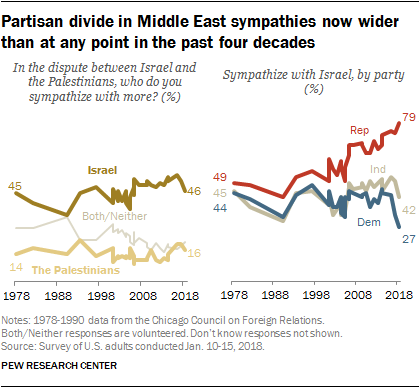 Among Democrats, the decline over the last few years in those who say they sympathize more with Israel is seen both among liberals and among conservatives and moderates. The share of liberal Democrats who sympathize more with Israel than the Palestinians has declined from 33% to 19% since 2016. Currently, nearly twice as many liberal Democrats say they sympathize more with the Palestinians than with Israel (35% vs. 19%); 22% of liberal Democrats sympathize with both sides or neither side and 24% do not offer an opinion. Moderate and conservative Democrats continue to sympathize more with Israel (35%) than the Palestinians (17%). However, the share of conservative and moderate Democrats who sympathize more with Israel has declined 18 percentage points since 2016 (from 53% to 35%). There has been less change since 2016 among Republicans: Large majorities of both conservative Republicans (81%) and moderate and liberal Republicans (70%) continue to say they sympathize more with Israel than the Palestinians. As in the past, there are wide religious differences in Middle East sympathies. White evangelical Protestants continue to overwhelmingly sympathize with Israel: 78% say this, while just 5% sympathize more with the Palestinians. Other religious groups sympathize more with Israel than the Palestinians, though by much smaller margins. Religiously unaffiliated people are divided: 29% sympathize more with the Palestinians, 26% more with Israel and 24% say they side with both or neither. Young people are more divided than older adults in where their sympathies lie in the Israeli-Palestinian dispute. About a third of those under 30 (32%) say they sympathize more with Israel, compared with 23% who sympathize more with the Palestinians. Those in older age groups sympathize more with Israel by wide margins. At this early point in his term, a plurality (42%) of Americans say that Trump is “striking the right balance” when it comes to Middle East policy. Three-in-ten (30%) say Trump favors Israel too much, while just 3% say Trump favors the Palestinians too much; 25% do not offer an opinion. At a roughly comparable point in Obama’s presidency (April of his second year in office), 47% said he struck the right balance, while more said he favored the Palestinians (21%) than Israel (7%) too much. Today, nearly half of Democrats (46%) say Trump favors Israel too much, while just 21% say he is striking the right balance. In 2010, more Republicans said Obama supported the Palestinians too much (38%) than said he struck the right balance. Trump gets high marks from his own party for handling the Middle East (73% of Republicans say he is striking the right balance). Eight years ago, 66% of Democrats said the same about Obama. Opinions of Israel’s prime minister, Benjamin Netanyahu, are basically unchanged from last year. About as many say they have a favorable view (31%) as an unfavorable opinion (28%) of Netanyahu; 41% express no opinion of Israel’s prime minister. Republicans, particularly conservative Republicans, have positive views of Netanyahu on balance. Six-in-ten conservative Republicans (60%) view Netanyahu favorably, while just 13% have an unfavorable opinion. Democrats’ views of Netanyahu are much more negative. And among liberal Democrats, more than three times as many have an unfavorable view of Netanyahu (49%) than a favorable opinion (15%). Americans continue to be divided in their views of whether or not a way can be found for Israel and an independent Palestinian state to coexist peacefully. About half (49%) say that it is possible, while about four-in-ten (39%) say it is not. Views about prospects for a two-state solution are correlated with Middle East sympathies: Among those who sympathize more with Israel, 40% say a way can be found for Israel and an independent Palestinians state to coexist peacefully. Among those who sympathize more with the Palestinians, 64% say a two-state solution is possible.